Tim Riley — Most people can dig a hole and cover up the roots. With a little water, the tree will grow into something to be proud of. Sounds easy? Well it’s not that simple. That maybe the most basic principles of tree planting, but there is a little more to it than that, that can save you money, years of headaches and disappointment. Let’s start from the beginning. We are USDA planting zone 5a. This represents cold hardiness to -20 to -15. Read your plant tag or do research to select plants that are zone 5 or lower. Do not think that every plant they have in our local stores are hardy for your area. They are not! In my experience, most of the trees sold locally are of planting zone 5 or lower, but I would say 20% of the shrubs and perennial sold are zone 6. It may be possible to grow plants only cold hardy to zone 6, but they are rare and it’s truly a gamble with your time and money. Know your soil. Is it black, rich with organic material, and well drained? If it is, you have won the lottery of soils and you can probably grow almost everything with ease. The reality is that most of us in west central Indiana are dealing with high clay content (the blond colored soils). Clay soils lack in nutrients, can hold too much or too little water, and hard to roots to grow into. Amending the soil with organic material may be necessary, but always mix it with the existing soil. My rule of thumb is one shovel of organic material to two shovels of native soil, mixed well. 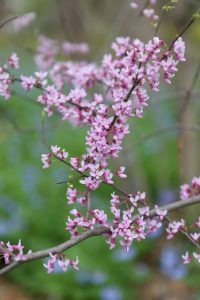 An example of trees that can’t tolerate heavy clay soils are Flowering Dogwood and Hemlocks. Is where and how my tree grown in important? Yes it is. Trees that are locally grown are always going to do better because they are acclimated to the environment and soil type. Your local, privately own garden centers, are about the only place to find plants locally grown. Big box stores usually get their plants from large growers in distant states, like Oregon and Tennessee. Buying these trees from box stores are usually fine, but you have to be careful because they often come in leafed out too early and freezing temperatures can really cause harm. Trees are sold as B&B or in root pruning bags or plastic container form. Tree that are grown in natural soil and then balled and burlap (B&B) are the best for planting, due to natural spread of roots. A down fall to B&B is that they are usually heavy to handle. Root pruning bags are better, but not common in the stores. The bags allow the root grow up to the edge of the bags, then pinch if off so the root doesn’t turn causing girdling roots. Plastic container grown trees are common in box stores, and are at the highest risk of developing root problems in the future. The roots hit the side of the container, then turn and grow around the edge of the pot. This girdling of roots will choke a tree to death in a few years. Shrubs are usually not as big of an issue in plastic pots. You should always cut any girdling roots before planting tree or shrubs. And finally, Plant your tree at the right depth. Planting too deep is such a common problem, and is likely to cause certain death. Most all trees have “root flares”. This the area right at the ground where the truck starts to angle out or flare out as it goes into the soil. Never plant the trees root flares below ground level. Tree Bark planted below ground will only rot and die if kept wet from soil or mulch. Sometimes you have to remove soil from the top to find the root flames, but I’ll be glad you did. In conclusion, if you pick a tree that fits your locations light requirement, maturity size and follow the 4 steps above, you should be successful. Don’t forget to keep your tree watered the first two years after planting. Thank you for make the world a greener place. 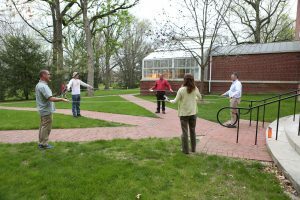 Tim Riley — On a warm spring day in 2016 during Earth Week, Tim Riley hosted an arboretum walk with a small group of interested faculty and students. 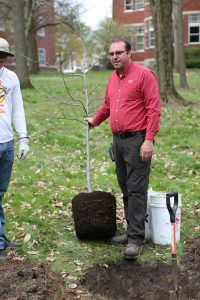 The agenda was to discuss the past, present and the future of Indiana’s trees and the part Wabash College Arboretum plays in that future. 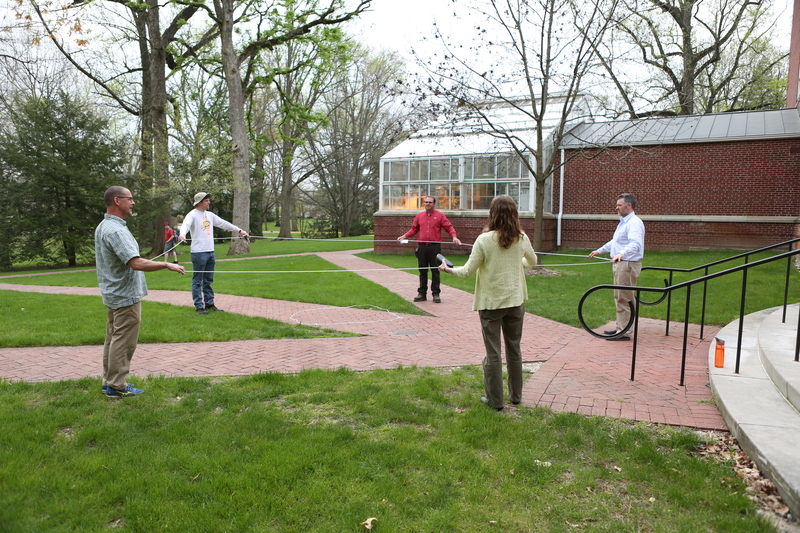 An early activity on the tour had the group holding a rope in a circle fifty seven feet in circumference, roughly eighteen feet in diameter which is the size of most above ground pools. This represented the trunk size of the largest tree ever recorded in Indiana, an American Sycamore (Plantanus occidentalis), located near Kokomo. However, at the time of this discovery, the grand old tree had fallen to the ravages of nature and a gnarled and ancient stump greeted the lands new inhabitants and explorers. It is considered the world’s largest Sycamore stump measuring twelve feet high and eighteen feet in diameter. In 1916, the stump was relocated to the Kokomo City Park for preservation. It is still there today along with other attractions like the world’s largest steer exhibit, if that is your type of thing. 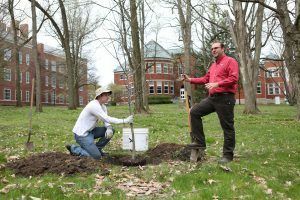 Trees are the silent sentinels who endure generations and are at the very heart of what gives Wabash College and the state of Indiana some of the most beautiful landscapes in the country. Wabash College Arboretum has a diverse and near complete collection of Indiana native tree species. There are a few that are not represented on campus but most are unable to grow in our climate and do not reflect the state’s general population of trees. We also have many other species that are not native to Indiana but still very valuable assets to the campus. The Arboretum consists of close to ten acres of slightly rolling terrain, covered with shade and proud strong trees bordering the East and Northeast side of campus. Oak, Maple, Beech, Tulip and Ash are the most abundant species of trees. The book, “50 trees of Indiana” written by T.E. Shaw, has been the long time standard for the planting of the Wabash Arboretum. Of the 50 trees selected by Shaw, we have over 80% represented on campus. We are always striving to have representatives of every tree species that is native to our state and plant around twenty new trees each year. The future of Wabash’s arboretum is exciting and worrisome. Since 2010 there has been several years of weather extremes. Not always damaging storms take out our gentle giants, but excessive periods of heat, drought, and rainfall have brought an end to many of our most historic trees. These environmental extremes add stress that has led to secondary pressures of pest and disease. Many of the older trees are suffering or have succumbed to these secondary pressures. The Emerald Ash Bore is now widespread in Montgomery County. Preventive treatments are ongoing, with hopes to save a small population for future study. Unfortunately, Ash trees ( Fraxinus) will be the next great tree species to be all but eliminated in our State and on our campus. But cases like that of the Ash tree spur on new hybrids and species tolerant to its predecessors killers. Trees like the American Chestnut and American Elm once were plentiful but now are few in number throughout the state. But we now have new hybrid species being introduced with a strong resistance to the pests and disease that once took them out. Each year brings a new set of challenges, but we are committed to preserving our campus trees and doing all we can to ensure Wabash will Always be a place where trees Flourish and shade the next generations of Wabash Men.